Stories of the impact of collaborative inquiry, as told by our teacher scholars. This whole year of inquiry was sometimes frustrating and I even resented it at times, but the results led to feelings of success among my students and me. While I can’t say that each student transformed into an error-free writer, they were happier and more productive writers because I learned to focus on the student, not the product. A big teardrop plopped onto Makel’s paper, he dropped his chin to his chest, crumpled up his paper and exclaimed pitifully, “I can’t remember to leave the spaces!” He proceeded to drop his head onto his arms and cry. I was momentarily stunned. “What in the world? !” I thought. “Is he sick? What the heck just happened? He was just grinning proudly. Why is he crying?” He was one of my toughest. I’d just complimented him on the details in his usually unrecognizable illustrations, on using the Word Wall Worm, and on capitalizing his friend’s name. Then I said, “Hey bud, I only see one thing wrong: you gotta remember to leave those spaces in between your words.” Was this it? This incident changed my inquiry and me. Since earning my degree in Early Childhood Education, I’ve always wanted to teach kindergarten. I imagined my future munchkins excitedly entering their classroom, as I sprinkled magic learning dust on them. Witnessing one of my toughest cookies crumble made me feel like a failure. Within our school-wide focus on the Lucy Calkins Writer’s Workshop curriculum, my original inquiry focused on sight word acquisition. I had had modest success teaching sight words last year and felt this was an area in which I was strong and could prove to others and myself that in this 3rd year of teaching kinder, I actually knew what I was doing. I was 3/4 of the way through my second year of the Mills Teacher Scholars Inquiry Program. I’d made tweak after tweak based on peer input and meetings with our Mills leaders. I started out with sight word flashcards as nightly homework, quick daily drills, plus quizzes during guided reading. I’d added a sight word center in every week of literacy stations and some games. I thought I was heading in the right direction. I was consistently passing out new flashcards as students mastered them. Out of 20 students, only three were not meeting or progressing towards expectations by the third trimester. Yet, it was still a struggle to get those results to show up in their writing. As I recounted Makel’s story to my kinder team at our inquiry meeting, the advice of my co-worker (who has been teaching for 50 years) finally settled into my basket of expectations. She’d repeatedly told us that kinders are not developmentally ready for the type of writing we were expecting. I suddenly imagined myself as a wicked witch riding a super-powered vacuum, sucking up all their joy by nitpicking at the nuts and bolts of their writing instead of developing joyful confidence in communicating their thinking on paper. I realized that my students needed to feel their voice was more important than their product. After that turning point, rather than pour a bucket of water on the writing curriculum, I decided to use what was working and add alternatives to help my students feel more successful. I wanted to teach writing in a way that worked for them. 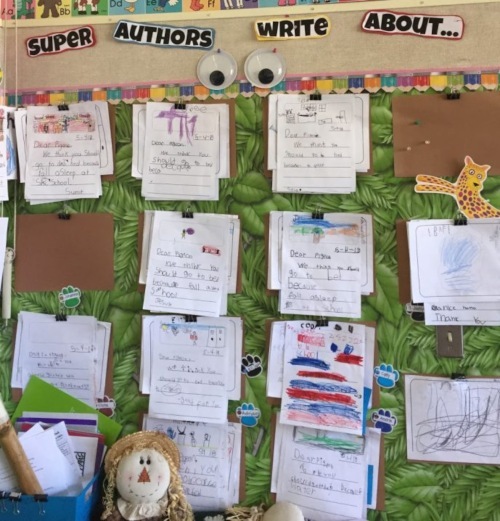 I decided that the best way for them to “follow the yellow brick road” of writing was to for me to explicitly lead them with more joy – and lots of guided instruction. Along with some Writer’s Workshop strategies, I added various shared activities we could write about together. I found great tools online and included art activities tied to our writing to make it more meaningful. I read numerous blogs and articles on teaching writing. A few weeks into this shift, Makel slapped his paper down in front of me, smirking and trying not to beam. “ Here!” he said, testing me to see if I would mention the mistakes I saw. “Why, thank you, sir. Hmm, this looks interesting – tell me about it.” As he “read” the story to me, I noticed clusters of words squished together, missing capitals, misspelled sight words (ugh!!). It still bothered me a little, but I reminded myself that we would practice these skills during small groups. My suggestions would come across less personally when everyone in the group was getting some. I gave him a high five for finishing his story. He was so happy he was done that he hugged me. Perhaps it was because the students who were ready to publish got free time. But I’d like to think it was also because he felt he could trust me to celebrate the story itself, and not how it looked. Just like the characters at the end of The Wizard of Oz, I finally got it. I realized I had what I needed within me. It was okay to get it wrong. The purpose of inquiry is not to demonstrate I was awesome and try to prove myself, but to dig in and constantly investigate how to teach better. I felt like I was finally back in Kansas. A Miss Honey wannabe (from the movie Matilda) Tonie Mitchell is a 15 year veteran educator currently in her 4th year of teaching Kindergarten with the San Lorenzo School District. She serves as one of her school’s union representatives as well as on its leadership team. Tonie gets a kick out of the way people react when she tells them she teaches Kindergarten because it is indeed a very hard job that she is passionate about and is definitely not doing it for the money. When not in her classroom, hunting for books in her local library, searching kinder blogs, or reading kinder research materials, she enjoys spending time with her family, cooking, reading just for the fun of it, walking her dog Grace, and spending time perusing Pinterest for…you guessed it kinder related postings. My students needed to feel their voice was more important than their product.